On this day in 1984…..
Kate & Allie, a sitcom starring Susan Saint James and Jane Curtin premiered on CBS as a midseason replacement. The innovative show revolved around two divorced single mothers, Saint James and Curtin, dealing with the day-to-day issues of parenting, dating after divorce, and getting along with their exes. Susan Saint James played free-spirited Kate McArdle and Jane Curtin played her more traditional friend from childhood, Allie Lowell. After divorcing, the two women find themselves as single mothers without a lot of money, so they decide to share a brownstone in New York City’s Greenwich Village and raise their children together. Kate’s daughter Emma was played by Ari Meyers, while Frederick Koehler played Allie’s son Chip, and Allison Smith played her daughter Jennie. Kate and Allie were strong, independent women who knew what was up when it came to the dating games with me; they dated quite a bit and were not against the idea of marrying again should the right man come along. 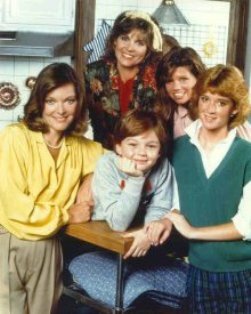 Although the women were clearly heterosexual, the higher-ups at CBS were worried the audience would think the women were lesbians, so the producers were told to show Kate and Allie retiring to their separate bedrooms at the end of each episode. Kate & Allie was one of the most popular shows of the 1980s and consistently ranked as one of the Top 20 shows through its entire run. I watched Kate & Allie as a kid and I loved it. It’s the first show I remember in which children argued with their mothers like I did with mine. The single mother thing hit pretty close to home too. It may not seem like much today, but in 1984 Kate & Allie was quite progressive. next post: Harrison Ford And Calista Flockhart Are Engaged! 50 queries in 0.687 seconds.